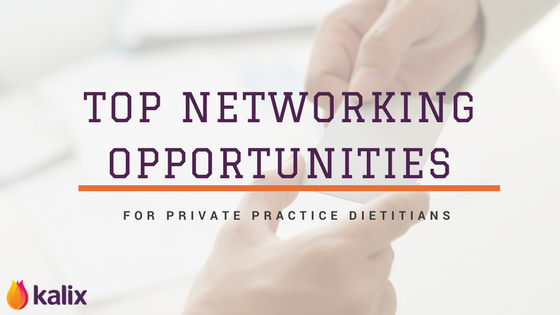 Top Networking Opportunities For Private Practice Dietitians – The Official Kalix Blog. As discussed in our previous blog, networking is vital to the success of any private practice or business in general. Today we will delve further into some of the networking opportunities that are available to nutrition professionals. Meetup is an online platform that allows you to find, organize and join special interest groups and meetings that are run in your local community. Business development, networking and health, and wellness, specific groups are common. Joining Meet-up groups can be useful for meeting local people who can be potential clients or referral pathways. If you are a member of The Academy of Nutrition & Dietetics, you have the option of joining Dietetic Practice Groups and Membership Interest Groups. These groups specialize in specific areas of interest or practice, e.g., Integrative and Functional Medicine, Diabetes Care, Weight Management and Business. Joining such groups is a way of connecting with colleagues who share your interests as well as establishing yourself as an expert in your field. They often have special discussion boards, Facebook groups, and webinars which you can participate in. We especially recommend joining The Nutrition Entrepreneurs Dietetic Practice Group. They have a specific focus on private practice, business development, and entrepreneurship. There are many local, state or nationwide conferences you can attend for face-to-face networking. The National Academy of Nutrition & Dietetics annual conference – Food & Nutrition Conference & Expo (FNCE) is held in a different state each year. This 3-day conference has many various networking events to offer. If you are looking for something more local, each US state has their own affiliate state dietetic association which usually hold their annual conference and other meetings. There may also district dietetic associations and meetings find out more by clicking here. Online groups such as those via Facebook are very popular. There are many dietitian specific groups which you can join. Kalix EMR has its own Facebook group, click here to join.